I had a procedure on my back on Monday and while it was easier than I thought, it put me behind a few days. I mentioned on FB that I needed to do 50 bags for a staff party on Halloween and I didn't know if I could sit that long yet. So my high school buddy Karen said "I'll come over after work, lets play! True to her word, she showed up and we pounded these out in about 2 hours give or take. That included a dinner break. She was so proud of herself, she has zero cutting experience, machine or otherwise. I was so happy for her. We loaded up 2 bags per Mat and set it for 26 mats. 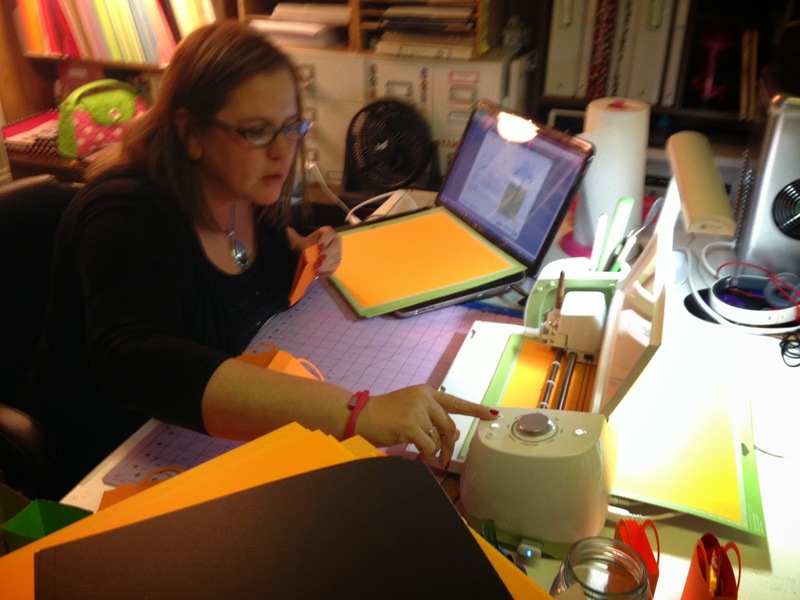 She folded and glued them all. 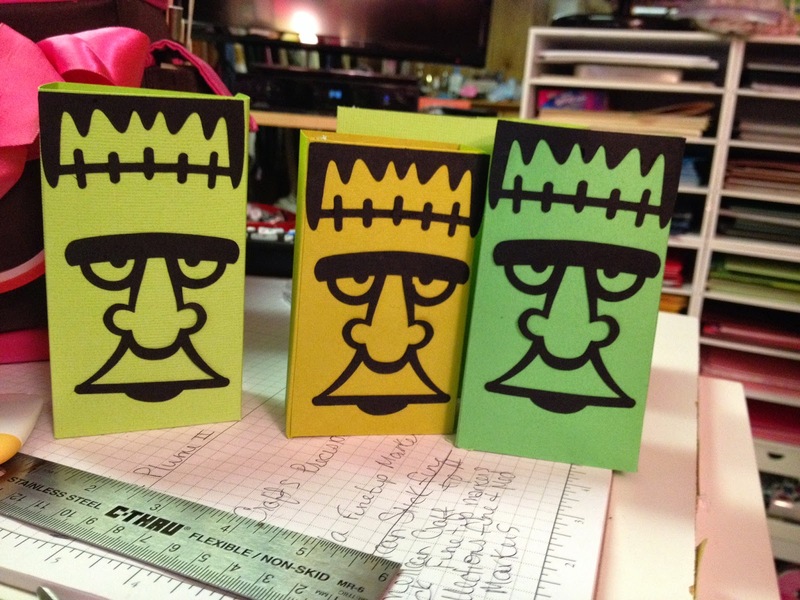 The frankenstein was for her step-son and was full of m&m's. Our original idea was to make 50 of those. Uhm... NO. Too much glue. So while she assembled bags, I cut the tags for the front. After the bags were assembled I filled them with treats while she ran the lil tags thru the zyron to get glue on them. She was so excited about how easy it was. 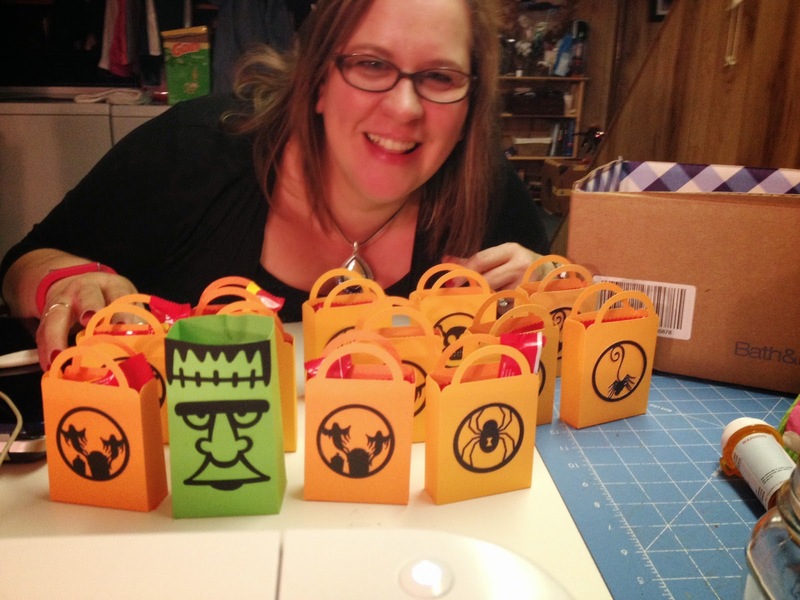 Here's some more Frank bags - I did a few of those for the treaters we get this year. Normally only a handful. Before Karen got here, I decided to play around a bit with the candy bar wraps and this is the result. 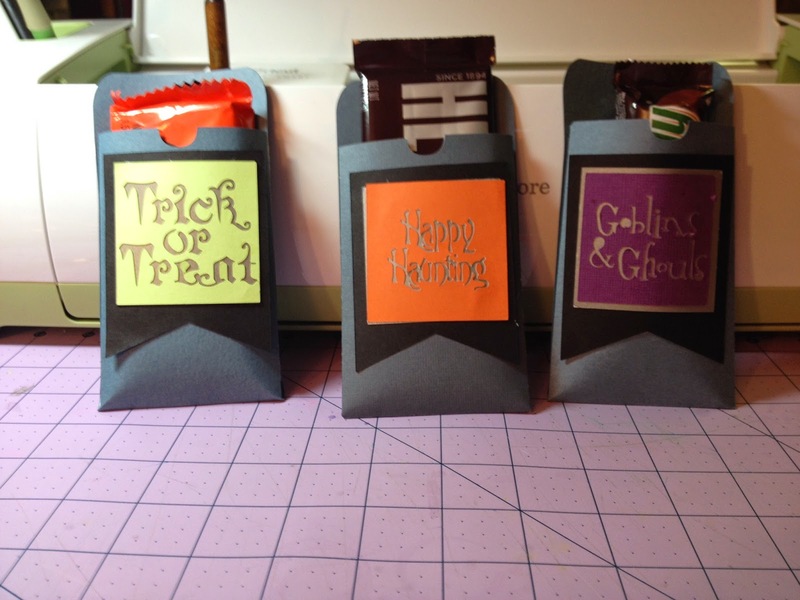 I did have trouble with the Goblins & Ghouls tag. It kept tearing no matter what kind of paper/card I used. I finally changed the blade and that worked but it was odd because I've only cut Cardstock about a half dozen times. These candy bar holders are in the Design space project gallery. I already owned the cartridges used so that was not an issue. Next time I would like to make the sides a little larger to hold a Reeses cup or thicker candy bar. That's it for me. I hope you guys are enjoying the posts.